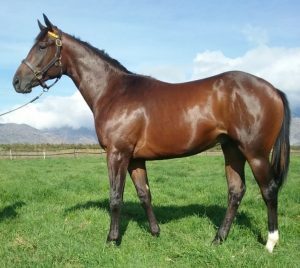 Among Boland Stud’s strong draft for the 2019 National Yearling Sale is a very well related colt by Querari. The latter, a G1 winning half-brother to high class performers Quasillo and Quidura, has firmly established himself as one of South Africa’s most consistent sires of stakes performers. Querari, who had eight stakes horses in his small first crop, has already sired more 30 black type performers from his small first four crops to race. His star performers include Gr.1 Thekwini Stakes winner Querari Falcon, millionaire Kangaroo Jack, exported Gauteng Guineas hero Monks Hood, and fellow graded stakes winners Cosmic Light, Wonderwall, Pinnacle Peak. Querari’s Sabine Plattner owned son Head Honcho currently rates as one of the better older horses in training, with the La Plaisance bred gelding having won the 2018 WSB Gr.2 Premier Trophy by 3.5 lengths before finishing a bang up third in this year’s Gr.1 Sun Met. To date, Head Honcho has earned over R1.5 million! Boland’s Querari colt (Lot 226) has been named Fire For Sure, and he is out of the three time winning Count Dubois mare Surefire (who won from 1200-1400m). He is thus bred on the same Querari/Count Dubois cross as top sprinter Pinnacle Peak, Gr.1 Thekwini Stakes runner up Melliflora, and Christmas Handicap second Kazaar (who earned over R500 000 in prize money). Clearly this is a mating which works! The well-bred Surefire is a half-sister to Gr.3 Kings Cup winner Pirate’s Gold and is from the immediate family of R6 million plus earner, and triple Gr.1 winner, Captain America. Further back, this is the same Queen Of Light family as major international Gr.1 winners Desert Prince (Irish 2000 Guineas), Fairy Footsteps (1000 Guineas), Light Cavalry (St Leger), Greinton (Hollywood Gold Cup), Lawman (French Derby), and Cape Blanco (Irish Derby). Boland Stud’s Eugene Freeman has taken a strong liking to this well bred colt, and describes him as, “”He is beautifully balanced and is an absolute cracker of a colt!”.